This combo is just pretty much the best of both worlds..! The bike was sold and serviced at the same Harley Davidson Dealer since new. It is also the first year of the CVO (Custom Vehicle Operations) Screamin' Eagle motorcycles produced by Harley Davidson in the Touring Division. HD chose the Road Glide platform to build it on, simply because the Road Glide is generally considered by most "touring" riders to be the "ultimate road bike" in the Harley Davidson model line-up. There were only two colors available that year and this is by far the most popular, since it has such a great paint scheme and also reflects the timeless HD classic Orange and Black color combination. The CVO division actually named this color scheme Vivid Black/VR Racing Orange/Arctic White. Then to top it all off, it is one of only about 700 ever built TOTAL..! Regarding the side car: This is a Motorvation Roadster Royale with the Electric Lean Option. This truly is a state-of-the-art sidecar with double passenger capabilities. 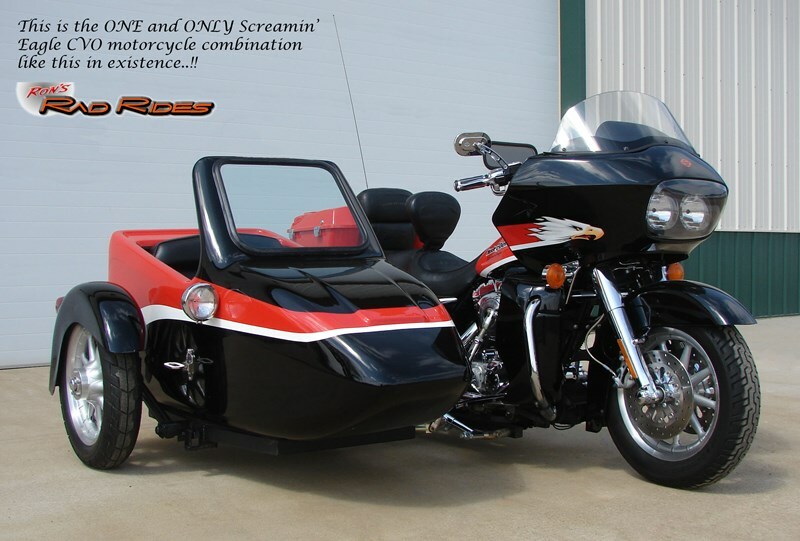 This large sidecar will seat someone who is over 6 feet tall and weighing over 250 pounds in comfort. It can handle up to three small children, or accommodate two teenage kids. There is almost 5 cubic feet of storage behind the seat which removes so all the space can be used for cargo or even sleeping. The Electric Lean Option allows you to simply move a toggle switch located on the left handlebar of the motorcycle and change the camber or "lean" of the sidecar. With this technology you can adjust for the crown of the road, weight in the sidecar, weight on the motorcycle, side winds, and a number of different variables that greatly affect the steering and handling of the complete combination. This camber and lean adjustability is achieved by the implementation of an electrically operated "screw cylinder" that is incorporated into the mechanism of the suspension design and sits in a parallel configuration between the sidecar and the motorcycle. The "screw cylinder" simply moves in or out by means of an electric motor which in turn moves the entire sidecar up or down to a specific camber angle, and ultimately creates the perfect positioning of the motorcycle/sidecar suspension combination. Needless to say, this now allows the driver to truly enjoy driving the bike without "fighting" the handlebars to keep the bike straight all the time and ultimately makes driving far more comfortable and safer. And.., the greatest thing is this..! YOU CAN DO THIS ALL ON THE FLY..!! Just press the toggle switch and adjust for side wind, road crown, different passenger weights or whatever, right while you are driving down the road, so you can keep the bike in a "neutral" operational state and allow you to steer with ease. How cool is that??!! When looking at the complete combo, it's also very apparent the sidecar perfectly matches the original factory paint scheme on the bike, since the sidecar was custom painted to match the Screamin' Eagle CVO pattern on the Road Glide. And.., as you can see, it looks super nice..! The paint design pattern is the perfect complement to the layout of the original CVO paint on the motorcycle. Note: This truly is a very nice driving sidecar combination. With the horsepower and torque of the 1550 upgrade engine that comes in the CVO Road Glide, you have plenty of "juice" for any passenger/weight combination you may encounter. Combine that with the advanced handling technology and passenger comfort of the Motorvation Sidecar, and you have yourself an absolute pleasure ride waiting for you and your choice of lucky person(s) with whom you "choose to cruise". And.., of course you will be the "coolest guy or gal in town" when you give ANYONE a ride in this! You'll be their new best friend..! So.., with Harley's best bike (CVO) and the generally considered the best sidecar built, how can you beat this combo..? You simply have the best of both worlds..! And, incidentally, the way Motorvation builds and designs their mounting systems, if you ever decided to have an inclination to ride the bike solo, it is very easy. A few wrenches and a little time and it will completely unbolt from the Road Glide leaving no unsightly welded on brackets or traces of even having a sidecar installed. Now, that's great engineering..! Super color combo, best CVO Harley, best Motorvation Sidecar, tons of room for passenger and cargo, and a fantastic driving and riding experience..! How can you beat that..?? Hello, I'm interested in your 2000 Screamin' Eagle® Road Glide®. Hello, I'm interested in making an offer on your 2000 Screamin' Eagle® Road Glide®. Hello, I'm interested in trading in my bike for your 2000 Screamin' Eagle® Road Glide®. Hello, I'm interested in taking your 2000 Screamin' Eagle® Road Glide® for a test ride.